“You Just Asked Me To Marry You," He Said, Still Waiting For Me To Admit Some Kind Of Trickery. "That Was The Real Deal, You Know. I Just Booked Two Tickets To Vegas For Noon Tomorrow. So That Means We're Getting Married Tomorrow Night." His Eyes Narrowed. "You're Going To Be Mrs. Maddox When You Start Classes On Monday." "Oh," I Said, Looking Around. 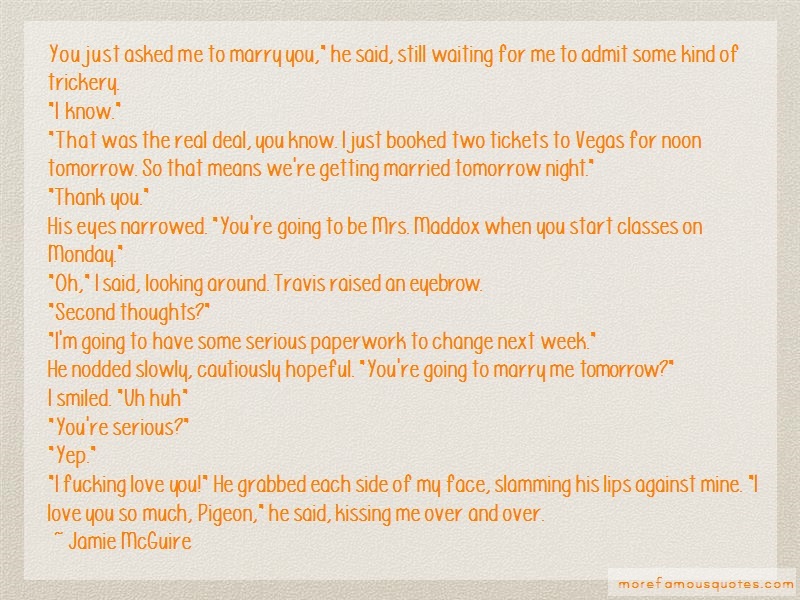 Travis Raised An Eyebrow. "I'm Going To Have Some Serious Paperwork To Change Next Week." He Nodded Slowly, Cautiously Hopeful. "You're Going To Marry Me Tomorrow?"